If your little one is walking, active, and energetic, then it may be time to get them skating. At the Hudson, MA Roller Kingdom we offer skating lessons specifically for the little ones during our Tiny Tot Roller Skating sessions. 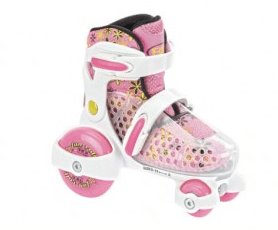 When is Tiny Tot Roller Skating? Tiny Tot Roller Skating takes place every Thursday from 9:00 am – 10:30 am. Registration is from 9:00-9:30, skating lesson from 9:30-10:00 am, and skating practice is from 10:00-10:30 am (if there is a private rink rental, there will be no practice at 10:00 am). Cost for the weekly lesson is just $5 and parents are free. Where is Tiny Tot Roller Skating? You can join us for Tiny Tot Roller Skating at our Hudson roller skating rink. Tiny Tot Roller Skating is just $5. This includes quad skate rental, and did we mention that parents are free?! Our Thursday Tiny Tot Roller Skating offers a great opportunity for you and your little one to get out and enjoy some exercise together. Your little one will feel so proud and accomplished when they show off their newly acquired skills on wheels. Whether you are a work at home parent, stay at home parent, grandparent, nanny, or sitter, you are welcome to bring your bubbly charge with you to Tiny Tot Roller Skating. Skate rental is included, but we carry training skates in our pro shop as well. If you have any further questions regarding our Tiny Tot Skating, please contact Heidi or Bob at 978-567-5926.